Today, in a pleasantly surprising turn of events, Zion-I producer Amplive has decided to release his Radiohead remix project, Raindayz Remixes, after all. As has been widely reported, Amplive planned to offer an EP’s worth of remixes of Radiohead’s new album, In Rainbows. However, before he could issue them via his MySpace page, Radiohead’s management stepped in and threatened legal action. The project seemed dead, but today Amplive announced that he has been given permission to release the remixes after all. After a cease & desist put the breaks on Amplive’s Radiohead In Rainbows remix project, the online music community reasonably wondered if the tracks would ever see the light of day. Well, here they are. While the Oakland producer/DJ acknowledges that he probably should have contacted Radiohead (who were not involved in the project) to seek approval prior to making his interpretations publically available, an agreement has been reached between all involved parties and Amplive has been granted permission to release Rainydayz Remixes for free to the general public. Effective immediately, the eight-track record is available here. You can download Rainydaz Remixes at One Seven Six Six. Since that controversy has been resolved, Zion-I can go back to focusing on better things, like their upcoming tour with Mistah F.A.B. Dubbed the Fresh Coast Tour, it finds the Bay Area veterans touring around the West Coast with a slew of special guests, including the Grouch from Living Legends. But few in the mainstream media who covered Rainydayz Remixes acknowledged Zion-I’s existence. It seems like the group needs to tour the rest of the country, too, if only to show that Zion-I’s appeal runs deeper than a Radiohead mashup. In the meantime, the tour dates are below. 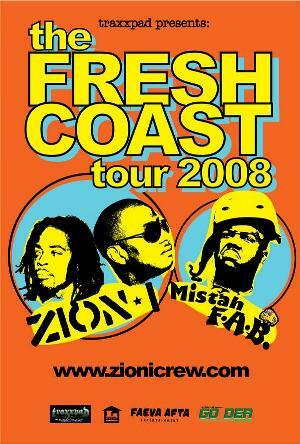 This entry was posted in News and tagged Amplive, Mistah F.A.B., Zion-I. Bookmark the permalink.